Married At First Sight Ning and Mark split during final vows. 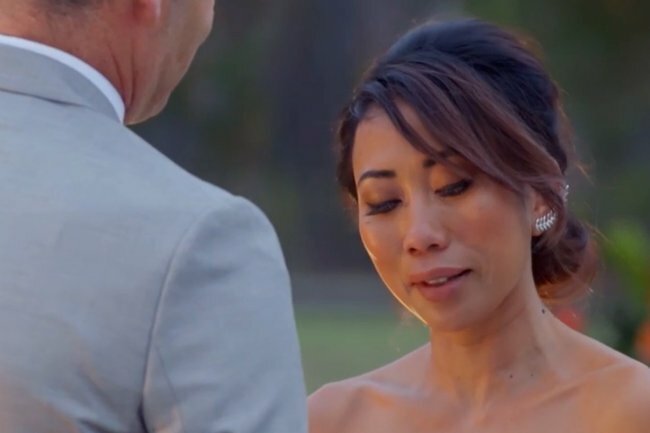 Australia reacts to Ning and Mark's brutal final vows on Married At First Sight. Tonight’s episode of Married At First Sight was rough. Look, we know it’s a reality TV show, but it’s really starting to upset us and we are not OK.
After spending a tumultuous nine weeks living together, Ning and Mark made their final vows and, well, it wasn’t exactly what we were expecting. “I entered into the experiment because I thought I was hard to love,” Ning told Mark. But Mark’s response was not what Ning was expecting. “Even though my feelings are strong, I don’t see them being strong enough to survive after this experiment ends,” he added. Mark continued to explain why he wanted to end the relationship but before long, Ning interrupted him. "Just stop. This is bullsh*t," she said. "You should&apos;ve let me go at week three. This is bullsh*t, Mark. I&apos;m sure someone else would&apos;ve healed me." Here&apos;s how Australia reacted to Ning and Mark&apos;s dramatic final vows. This is breaking my heart. Ning deserved better than this. Let’s all get under the covers and sob.